There’s a time and a place for hearty, warming meals. It just doesn’t happen to be when the sun is shining and we’ve got the air conditioning on. During that time, we turn to cold, no-cook dinners that are light but totally satisfying. Here, 30 recipes you most certainly won’t burn your tongue on. Store-bought marinated baked tofu combined with cold noodles makes this dish hearty, healthy and super simple to whip up. Add whatever veggies you picked up from the farmers’ market this week. The best part? If you plan for leftovers you can enjoy this guy more than just once. One of those recipes that’s easy, customizable (use whatever fruit or nuts you have lying around the cupboard) and can be eaten warm or cold. The choice is yours. Ideal for when we want something cool and crunchy. Did we mention this one’s vegetarian (and photogenic)? Featuring purple cabbage, broccoli, raisins, almonds, green onions and a creamy vegan almond-miso-orange dressing. Have you ever seen anything so beautiful? And you’re definitely going to want to put this savory-sweet dressing on just about everything. Topped with corn, chives, lemon, salt and pepper, this is not your average avocado toast. Sweet, salty and savory. Our new favorite sammy is what we call the ultimate triple threat. This lighter take on a classic Italian dish is packed with flavor. Just don't forget to pile on the freshly grated cheese. We sauté kernels cut right off the cob with leeks and carrots, then blend the veggies with stock, cream and seasonings. Top it all off with extra crunchy corn. PureWow Coterie member Ali Maffucci gave us this beautiful (not to mention colorful) bowl and we are forever grateful. Taste the rainbow. Packed with so many flavors and textures (veggies, artichokes, capers, avocado and a red wine vinaigrette), you won’t even miss the mayo. Ready thy Instagram because this rainbow of shredded cabbage, peppers and other fresh veggies topped with vibrant slices of avocado, might just be the most colorful thing you will ever eat. 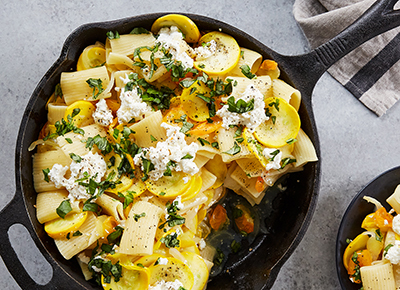 Meet the clean-eating version of your favorite comfort food: Stacks on stacks of our favorite veggies topped with extra cheesy goodness. Crispy kale? Check. Spicy shrimp? Check. Avocado slices, watermelon radishes and quinoa? Check, check and oh yeah, check. If you’re looking for something that’s on your diet, these guys are completely gluten-free, Paleo, and Whole30. Not to mention you can have them on the table in just 20 minutes. Topped with a lemon garlic-tahini sauce, this crunchy salad is the ideal cold dinner for a warm evening. So much more hearty than the average vegan summer roll. Drench these guys in peanut sauce and don’t forget to put out extra napkins. Coterie member Jodi Moreno recently stopped by the PureWow test kitchen to whip up this light gluten-free, Paleo and nutrient-rich dish. This is the summer salad of our dreams. Don’t forget to grab a handful of toasted bread cubes and crumble them over the dish for additional texture. Making soup can feel like a lot of effort for something that we could just get from a can. Enter: this flavorful recipe that's ready in no time. A light, zesty dressing and no actual cooking required make this dish our summer night go-to. Who needs a stove anyway? With some ripe produce and a blender or food processor, you can whip up this guy in no time. No heat (or effort) required. This grain bowl filled to the brim with the freshest ingredients (avocado, orange, pumpkin seeds and more) is about to become your new go-to dinner. So easy and refreshing. You can even make them ahead of time (up to two days in advance) and they won’t get soggy in the fridge. Serve the leftovers of this lightened-up tangy chicken salad for lunch. If there’s any left, we mean. Let seasonal produce be the star of your meal, because this vegan salad is packed with whole grains, protein, fruits and your favorite veggies. We’re combining all of the crunchy, savory, creamy ingredients of the classic sandwich—minus, well, the bread. A creamy soup to cool you down that can be enjoyed for breakfast, lunch, dinner or dessert. We don’t judge. Simply chop up all of the veggies, mix together the sauce, add in some rice noodles and taste the magic.